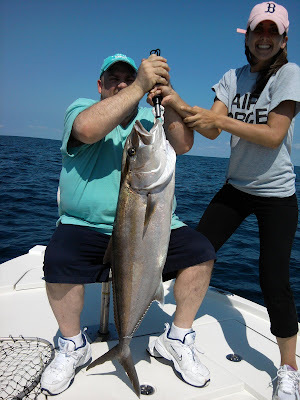 5/30/2011 Swansboro MAHI, KINGS, AMBERJACK! 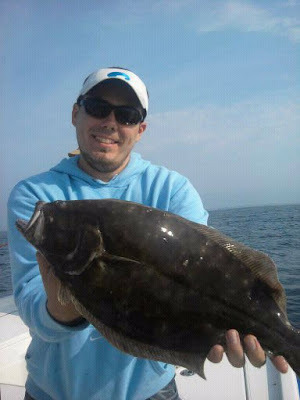 5/28 Fun with the Flounder! Left the dock this morning, Sat. 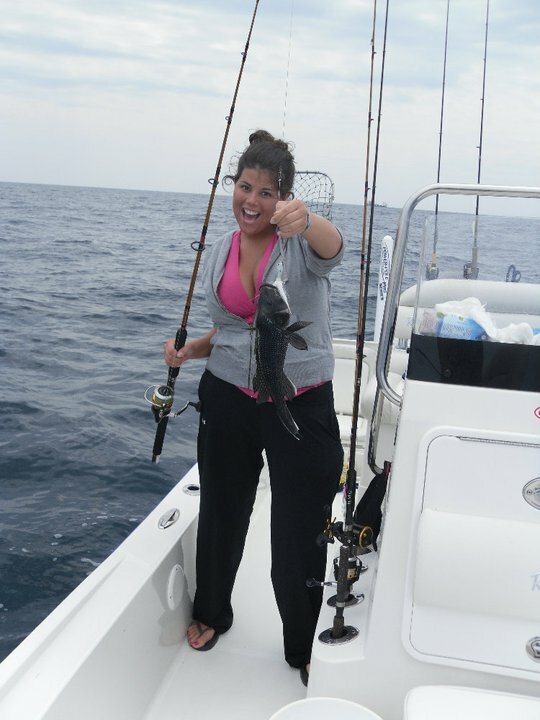 May 28th with Rebecca Gray and family aboard celebrating her birthday, anniversary, memorial day, and more! They really wanted to catch a mess of flounder.... So, we took advantage of some decent weather and hit some nearshore live bottoms bouncing our Berkley Gulp Baits on my favorite bucktails. It wasn't long before we had those flatfish coming over the sides. Rebecca wasn't feeling very well but just kept fishing... she was a real trooper... she was rewarded with one of the larger flounder at 20in. and 3lbs. We wound up landing about 25 flounder and kept 11 from 1.5lbs to 4lbs. Unfortunately we pulled the hooks off the big fish about 25in/5lbs at the side of the boat... Oh well, I get'm next time. Great job today and congrats on all those great occassions you and your family were celebrating today! 5/23/2011 BLOWING But We Found A Few Reds! 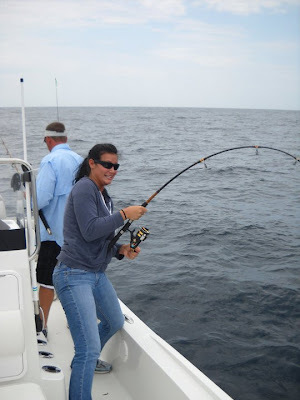 I had the pleasure of fishing with a Husband/Wife team onboard late this afternoon. 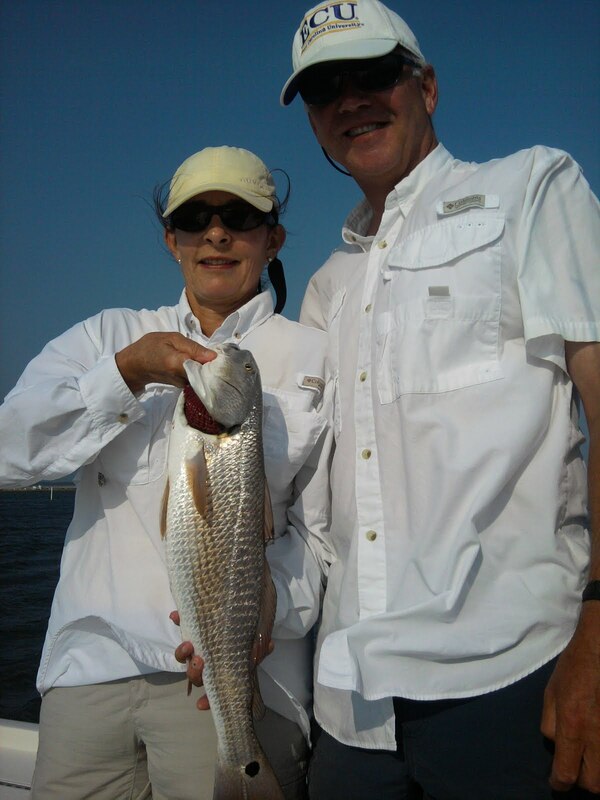 Dan R. and his wife moved here recently from Virginia and were wanting to learn a little about fishing inshore. Unfortunately, it was very windy but, truth is, that's what mother nature is going to throw at many folks on any given day you plan on going fishing... so, what do you do? Go fishing anyway and learn to work with Mother Nature. That's exactly what we did. I often find that no one is on the water with very windy days but, there are many places to hide from the wind or use the wind to our advantage. We did just that and eventually found areas holding reds. We landed a few purty reds and I got bit for the 2nd time in my life by a fish.... yep, only twice in my life... (knock on wood). minor bluefish bite... thank goodness that's all it was! Great afternoon and some purty fish for their Grill! 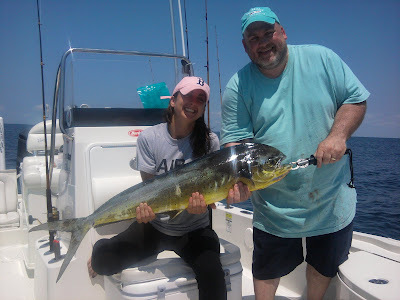 Team NCCharterfishing/Crystal Coast Graphics, Capt. Mike Taylor and myself, Capt. 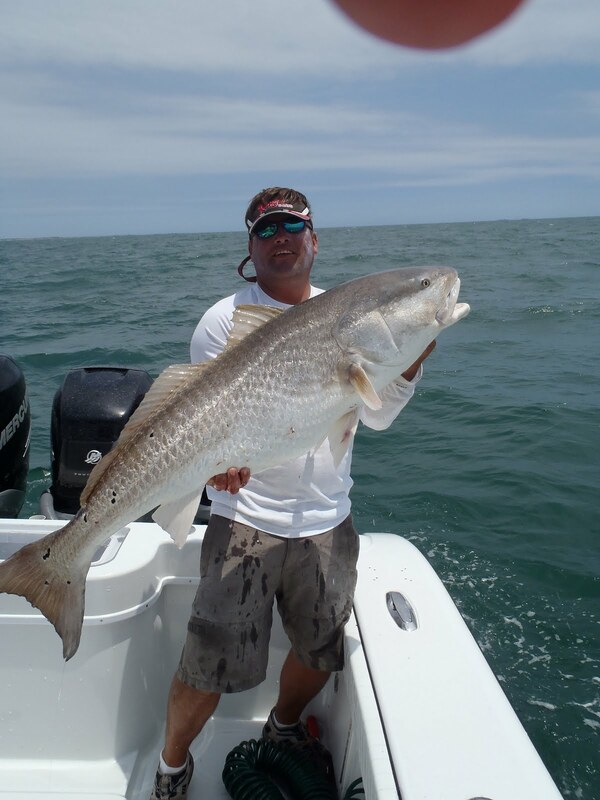 Jeff Cronk, fished the first tournament in the Redfish Action Redfish Series out of Beaufort, NC this past weekend. The weather was perfect and we had a rising tide all day. We didn't fish any schools of reds but, instead we fished a lot of little nooks throughout the marsh systems and managed to land about 12-15 redfish throughout the day. We were fortunate enough to have 4 of those fish that measured between 26 1/2in and 26 15/16in. Our largest two fish weighed in at 6.61 and 6.45 for a total aggregate weight of 13.01lbs and a second place finish. Cogratulations to the Tobin (father/son) team for their first place finish. This team has been fishing hard for the past few seasons and definately deserved a top finish! Great job! 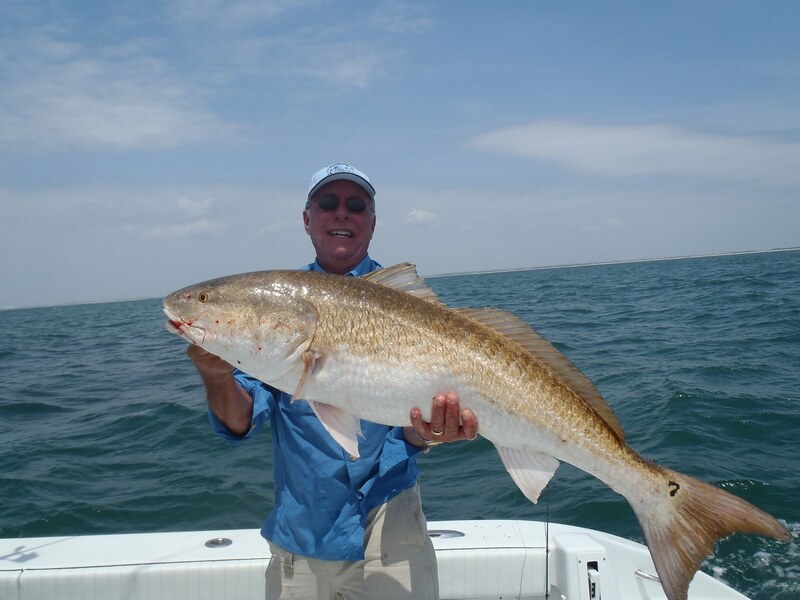 If you want to fish in this great Redfish Tournament Series, check out www.redfishaction.com for more information and upcoming dates! Team NCCHARTERFISHING AND CRYSTAL COAST GRAPHICS! I hit the water this afternoon for 4hrs with client Stuart C. and his good friend aboard. The wind was kicking but these were a couple seasoned fishermen and fished right through the conditions. We worked area after area and after 3hrs of fishing wound up landing 25 flounder of which we culled 12 nice sized fish up to 3.1lbs. All fish were caught on Berley Gulp Shrimp and bucktails. 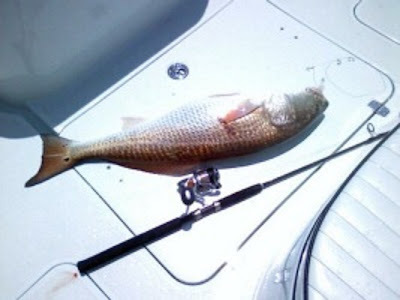 5/14/2011 Redfish and Flounder Pounding! 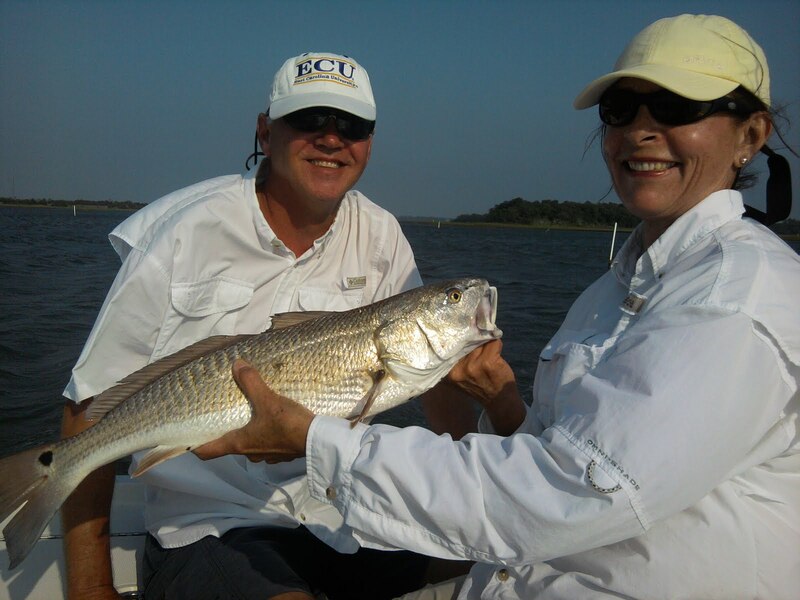 Come Fish the Crystal Coast! This morning I had Josh B. (soon to be married - congrats!) 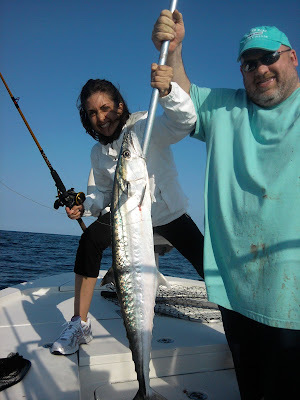 and his friends onboard with some beautiful fishing conditions! We lucked out and the strong T-storms moved through about 4am and cleared out just before morning. We started out casting artificial baits for Redfish and.... the first stop produced 6 hookups. We landed a few and then moved on for another quick stop...and another awsome strike in some flooded grass. My client did the right thing... locked down on the drag to keep the red from going deeper into the grass... and that red went skyward.. awsome sight! We boated him and then realized the wind had laid down to complete "slick cam" conditions.... so, with our limit of reds already in the boat, we decided to go flounder hunting... we, ran out the inlet (staying close to the beach due to redfish onboard) and within 10 minutes began doubling down on flounder. We worked over the flounder for the next 3 hrs and were able to land close to 30 flatties from which we culled 13 keepers (most around 2 lbs, several at 3lbs, and one just over 3lbs). We releaed LOTS of Seabass over 12inches! I can't wait until June 1st and the opening of the Seabass Fishery.. CALL NOW FOR JUNE AND JULY OPEN DATES WHILE THEY LAST! THANKS TO ALL OUR CLIENTS FOR YOUR SUPPORT! 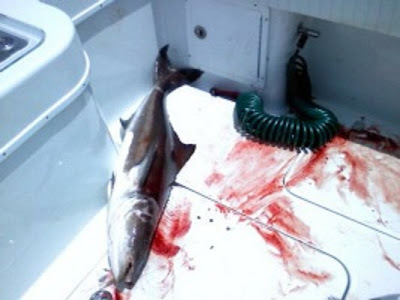 5/12/2011 9 Cobia, 6 Giant Red Drum! 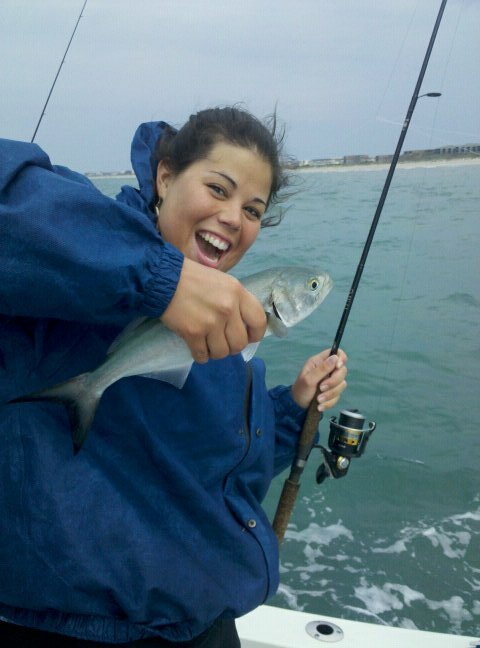 Fishing the Crystal Coast! Capt. Mike shot out the inlet this morning back in search of the "Brown Beast" after wearing them out yesterday afternoon running solo. They spent a couple hours working along with other boats on big bait balls close to the beach. 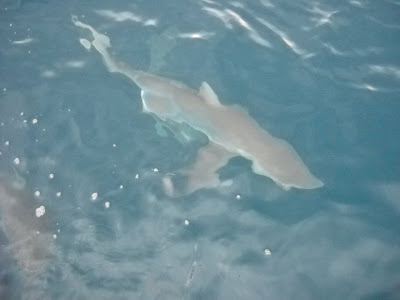 Then, about mid-day they moved offshore and found some bait about a mile off the beach covered with big sharks. Just beyond the sharks were cobia on the surface and they spent the next couple hours catching and releaseing Cobia, Sharks, and to their surprise, 40 to 60lb Red Drum! 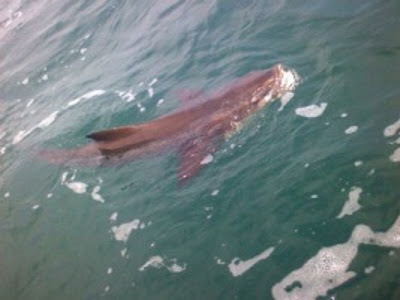 They wound up landing 9 Cobia, 6 Giant Red Drum, and a bunch of big Sharks... Most of their Cobia bit Berkley Gulp Eeels on bucktails and Berkley Gulp Power Bait Eels. Below are the baits we're using to target Cobia.... Berkley's 12in Pre-rigged Power Bait Eels.... a 3 to 4oz Bucktail tipped with Berkley Gulp's 10in Eel or the 7in Jerkshad. We're using 60 to 80lb flourocarbon as leader. 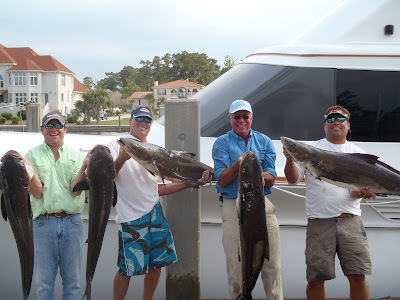 5/11/2011 COBIA BLITZ! MONSTER REDFISH! Capt. Mike shot out the inlet to take a quick joyride in the 26ft Yellowfin today around mid-day.... of course... he brought a couple rods just incase... he located some bait and started jigging and Wham! 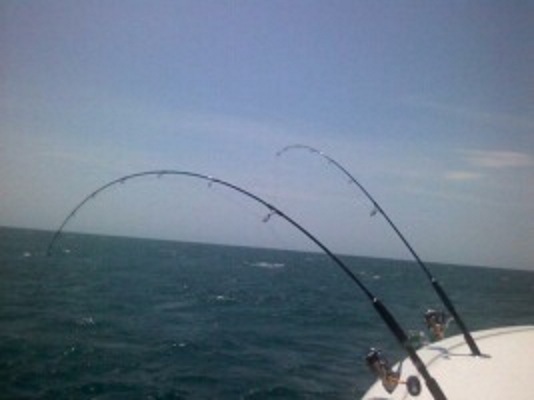 next thing he knew... he had several pods of 30 to 50+lb cobia at the back of the boat! He hooked up triples by himself... fought and landed all three...then battled and landed two more! 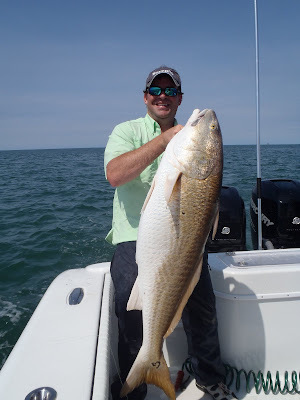 That was followed by a 30lb Redfish! What a morning...and to think... he was taking a joyride with no passengers onboard... Ouch! Someone missed out today! Great Job Capt. Mike (252-725-2623) Call mike for open slots for the next couple weeks to target your Trophy Cobia! Mike's been going at it all week with big fish almost every trip. CALL MIKE TODAY TO RESERVE YOUR TRIP! THIS BITE LASTS THROUGOUT MAY! I ran a few trips this this past week.... WOW! What a variety! 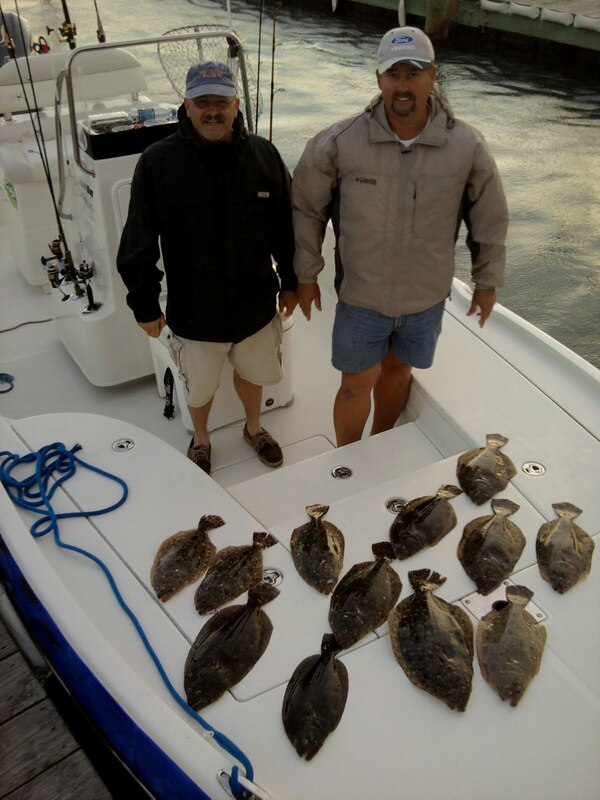 We've been smacking down almost every species available inshore and nearshore! Check out the shots below! Capt. Jeff Cronk.... call now for May,June,July,Aug. Availability... dates going fast! I had some regular clients onboard this morning. 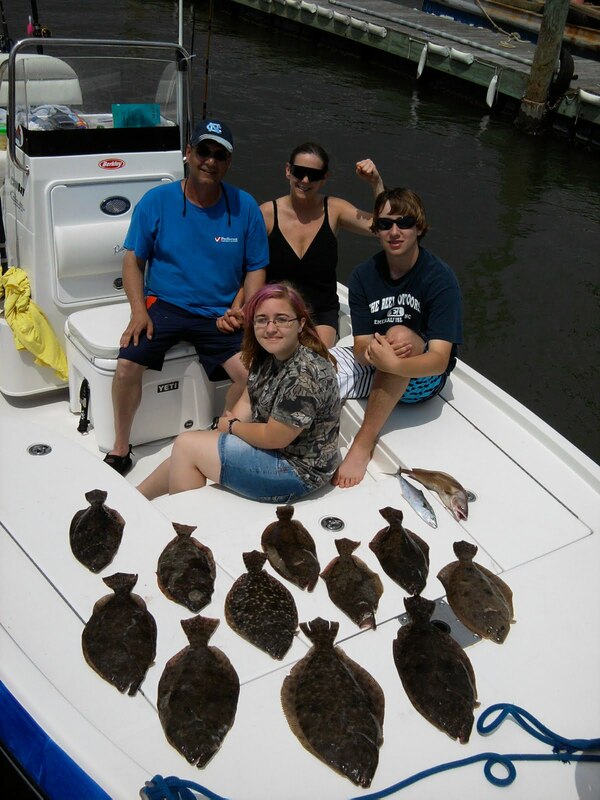 We fished the ocean for Summer flounder and had great success! The water temps ranged from 68 to 69 degrees and we found a few flounder on almost every spot we stopped on while jigging Berkley Gulp baits on Bucktails. My clients released a few and wound up with 22 keepers with the largest just under 5lbs. Great day with some very good fishermen! Call for open dates! 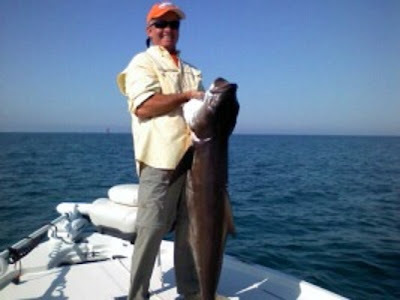 Also, the Cobia Bite is on.... Schedule now for your Trophy Fish!